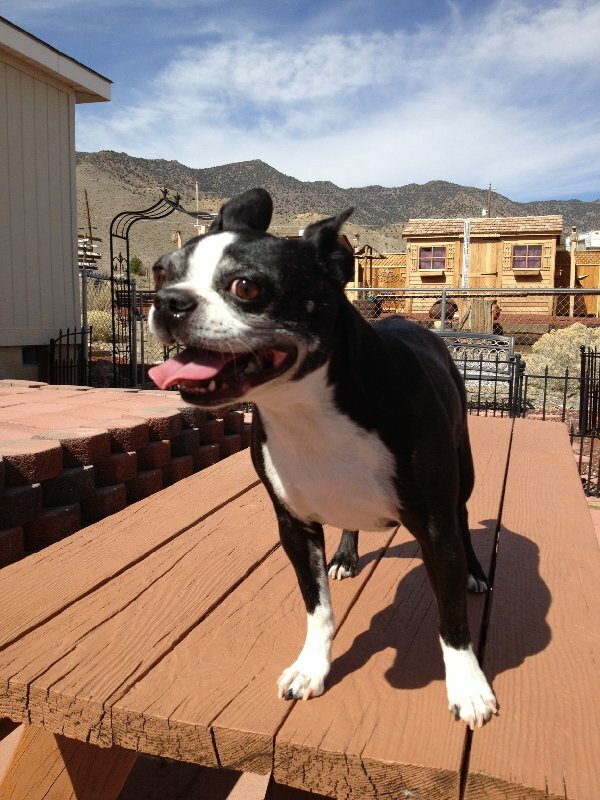 The Official Busy Bee of Molossia, Annie was our Boston Terrier and the apple of The President's eye. On 10 April 2017 XL Annie passed away at the age of 11 1/2, succumbing to heart failure after a long illness. Annie was named for Little Orphan Annie, of comic, musical and movie fame. Annie was until recently high energy and inquisitive, and she rarely missed anything. It was her job to investigate every corner of Government House and Norton Park, and then investigate it again in case she missed anything. In her younger years she moved at top speed, interrupted by brief naps, and was always ready to play. Annie was a ready and willing companion for any adventure, and she was certain that there was no situation she couldn't master. Above all she was The President's faithful companion and sidekick, always by his side or nearby. Annie was buried with honors in the Molossia Cemetery, and His Excellency, The President has directed that the Molossian flag will be flown at half-staff for three days in her memory. Annie will truly be missed.